Having started from the districts of Gimgim, the aggression of the Turkish state in the autumn of 2015 targeted the civilian populations of districts and provinces of Ferqîn, Lîce, Silopî, Sûr, Cîzre, Nisêbîn, Dêrik, Kerboran, Hezex, Gever and Şirnex, resulting in the massacre of hundreds of civilian population in the hands of the government security forces, hundreds of people also being injured, thousands of homes being demolished with the tanks and artillery fires. Also, the state forces tries to de-populate these cities by means of forcing them to migrate, of severing the most basic services, such as water, electricity, food supplies, and medical services through months-long curfews. As a result of these practices, hundreds of children had been orphaned and hundreds of families were rendered needy. The curfew, absolute prohibition of getting on the streets from the housing, was declared for the provincial centre of Sirnex at 16 March 2016, and it was kept on continuing for eight months. Later on, the curfew was relatively softened at 14 November 2016. After the declaration of this prohibition, many of the inhabitants were obliged to emigrate from the city. Neither a special location or an area to accommodate, nor the minimum requisite opportunities for continuing the daily life were never offered to them by the Provincial Administration. Some of the families could not emigrate from the city due to the lack of any place to go albeit there was a very hard and strict prohibition of the curfew application. And yet after a while of being cut the electricity and water services and thus were never ever able to provide the least daily life requirements, those families also were forced to emigrate from the city. Only a few groups of inhabitants kept on living stubbornly though of the all this oppressions, in the some city skirts in which there was no relatively direct conflicts. Just after the announcement of the curfew prohibitions, the city centre was attacked with the heavy artillery and weaponry shots by the army soldiers. A few trenches and barricades in some neighbourhoods had been established before the declaration of curfew prohibitions. However there were nothing like barricades in many districts of the rest of the city. Although this reality of the city, almost all the city centre and main old city were hardly destroyed, shops and manufacturing facilities were heavily damaged. The old architectural structure, historical old city, and natural environment were totally demolished and ruined. The war and conflictual period took a time of approximately 85 days, and later on the demolishing and ruining process moved on. In this whole period of disgusting and catastrophic times, the families had to live under unbelievably difficult conditions of poverty and deprivation. Leading with the right of life, right of health services, right of education, and accommodation were violated. To firstly focus on the children and the patients, all the society of the Sirnex city had experienced a very hard social trauma. The fresh and strong effects of this trauma have still continued. Under the name of the official rhetoric like the ‘risky areas, urban renewal and expropriation’, seven main neighbourhoods of the city had totally destroyed and erased from the city map. The rest of the city has still faced of this destroying and ruining process. In the February 2017 Report of the United Nations High Commissioner for Human Rights (OHCHR); Turkey is being accused of serious human rights violations. 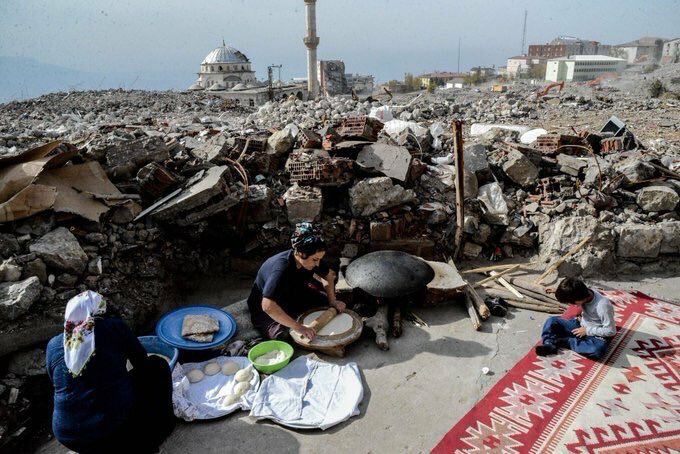 The Report focuses that following the collapse of the regional ceasefire in July 2015, Turkey is being accused of “serious demolitions, deaths and innumerable violations of human rights” made by security forces in cities inhabited mainly by Kurds in the south of the country. It is stated that during the time in between July 2015 and December 2016, “government security operations” displaced 355.000 to 500.000 people from their own residences. In the operations carried out by the security forces, 2,000 people were killed, of 1,200 were security officers, and the rest of 800 were mostly civilians and militants. The report states that the United Nations High Commissioner for Human Rights (OHCHR) requested of the Turkish government for an independent UN team to conduct unhindered investigations into the region in May 2016, but the Turkish government repeatedly failed to receive any response until February 2017. It is stated that the information in the 25-page report was prepared based on the confirmed and analyzed data obtained by the remote monitoring team of the United Nations Human Rights Commission (OHCHR). These data are based on interviews with the many rather than only one victim, witness and victim relatives, as well as documents submitted by the Turkish government and many Turkish and international civil society organizations, official records, public-open sources, satellite images, videos, photographs and sound recordings. The purpose of the sibling family project is to stop the migration, to provide emergency humanitarian assistance, to meet basic health needs, and to offer psychological support. Moreover, it aims to develop a relationship between the families in need of assistance, to introduce them with each other, and to provide assistance in the framework of fraternity law. The basic aim of this campaign is to support of a 1000 families of Sirnex city who are the poor, deprived, ill and victim of war. Moreover of the financial aid, the campaign has targeted that the supporters are able to develop humanitarian and solidarity relations with these families. Let you also be a supporter of this campaign! You can adopt a needy family of Sirnex and support them in their hard times. • The financial aid has to be minimum €150 pcm. Families who cannot afford this sum may get together and jointly put up this aid. • It has to continue for at least one year. Wishing to continue will be up to your initiative. • The aid ought to be sent directly by you. If you are unable to do so due to not having time etc, our Association will help you. • In addition, there is the necessity to develop humane relationship with the people in need, to develop relationship with them and if possible to visit them.